Why should you consider the merits of multiple kitchen sinks? As you prepare for the upcoming holiday rush, you may find that your kitchen is a little too cramped. What’s one good solution to this dilemma? You could plan a kitchen remodel. But if fully renovating your kitchen will prove to be too expensive, maybe you can change only part of it. Why should you consider the merits of multiple kitchen sinks? When you think about redesigning your kitchen, even in some small way, the sink is probably not going to be the most exciting part of the process. The first reason you should have two sinks is that you can help keep your kitchen clean. For instance, you could assign one sink for dishwashing duties while using the other to help prepare a meal. You also don’t have to have both of them installed side by side. In fact, if your kitchen is large enough, you could have one for the counter while the other is attached to the kitchen island. Kitchen sinks are a vital part of your kitchen, but during the remodeling process, you might overlook their importance. Did you know that you could make the sinks different too? You don’t have to use the same style of sink in both areas. You should also keep your cooking habits in mind; do you often use deep pots that are difficult to clean in your regular sink? Have a new sink put in that is the right size and shape to accommodate these pots. 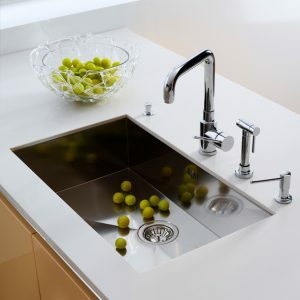 However you choose to configure your new kitchen sinks, you should find where they fit in the best. For instance, if you have a spectacular view, you should put your dishwashing sink by the windows so you can look out and have something to take your mind off how tedious washing the dishes can sometimes be. You should make the most of your remodeled kitchen, and accentuate some of the new features you have. Your kitchen may not be large enough to hold the hutch you previously decorated for Halloween, but it might be large enough for you to live out your dreams of being a bartender. Need to wash your hands or any bartending supplies? Having an extra sink can help. Even if you decide to use your kitchen island to prepare cocktails, a third sink specifically for making drinks might not be such a bad idea. Whether you’re looking to add an extra sink or completely renovate your entire kitchen design, the experts at Kitchen and Bath Depot are here to help with all of your design and building needs. We provide remodeling services for our valued customers throughout the Maryland and Washington, D.C. area. If you are ready for a quote and to see how we are different than other companies, contact us or give us a call at (301) 888-5324. For more tips, follow us on Facebook, Twitter, Google+, and Pinterest. This entry was posted on Wednesday, November 1st, 2017 at 10:17 am. Both comments and pings are currently closed.